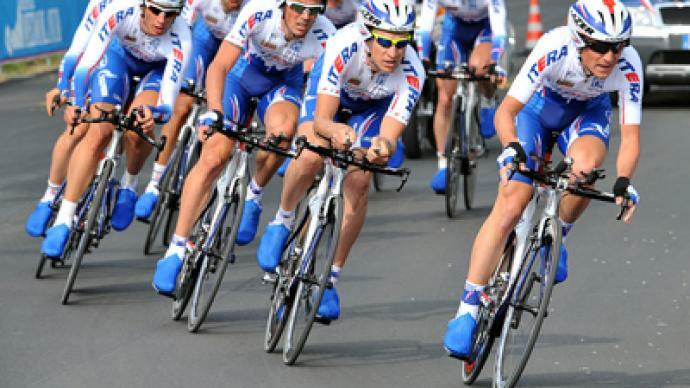 One of the world's most successful Cycling teams, Katusha, is set to unveil its 2011 roster at the end of the month. The competition for a place is as high as ever within the Russian team, with riders aiming to impress at their Cyprus training camp. ­The island of Cyprus was chosen by the Russian global cycling project Katyusha for its ideal winter training conditions and suitable terrain. It is a first-time experience for some athletes, but older members of the team have enjoyed the local advantages before. “I’ve been here five times. The best thing about this place is the warm climate. No other place in Europe can offer such good conditions: good roads combined with good weather. Even if it rains here, the weather is still warm, and we can cycle without feeling uncomfortable,” Nikita Novikov, Russia’s U-23 champion, said. Three teams took part in the camp including the continental Itera-Katyusha, and under-21 and -23 youth teams. The Pro-Tour is probably the ultimate goal for the young men and they know they stand a real chance. The 2011 version of the 30-strong Katusha Pro-Team has 18 Russian cyclists, so the abundance of contenders is obviously high enough. “All our boys have serious intentions. They know what team they’ve joined and what future prospects may open for them. Freeloading won’t do here. Our cyclists have to be eager and concentrated. Plus, with a prospect of joining the pro-tour team, the guys should be more purposeful and disciplined,” Aleksey Shchebelin, Katyusha’s Senior Coach, said. Katyusha is supported by major Russian businesses and the result of this co-operation has led to 67 podium places. The Russian global cycling project Katyusha is one of the finer examples showing how the business community is vital for the advancement of sport. In its three-year existence, the team became the most sought-after, not only by Russian cyclists, but by foreigners as well. In 2010 alone, over 80 per cent of Russian cyclists have applied to be on the team. A contract with Katyusha also paves the way to the national team for some cyclists, which they take quite seriously. “Yes, you can certainly feel the difference when you race for the Russian National Team or the Katyusha team. There aren’t as many races for the National Team as there are for Katusha and you feel more responsible and mobilized if you race for the national team,” Novikov said. While the Pro-team’s attention has turned to the season opener in Australia’s Tour Down Under, preparation for the upcoming season will continue in Cyprus as the island is getting used to seeing cyclists sporting “Russia” uniforms. Constant tests and struggle to prove your place on the team remain too. “The competition is tough. This year 80 per cent of Russian cyclists have applied to join Katyusha. I’ve been a member ever since the club was founded. I’ve strengthened my position since and the management has extended my contract for 2011,” Andrey Solomennikov, Russia’s U-23 champion of 2009, said. Katyusha will be looking forward to continuing to win titles in 2011. And with the reserves being hot on their heels, the leaders will attempt to take the team to new heights.